There will be a lot more like this as we progress, I promise you that. I'll be participating in Reading Rambo's Harry Potter All the Gifs Readalong, which basically means there will be a lot of gifs and a lot of my looking for clues of horcruxes and Dumbledore's awesomeness and generally oohing over how adorbs Dobby is and a lot of remembering how I spent most of my adolescence waiting for an owl of my own (I read the first book when I was ten so my eleventh birthday was simultaneously the most stressful and disappointing birthday ever, because, spoiler alert, I never did get an owl). Introduction-y bits: I am Kerry, from Maryland, and my Instagram account is pretty much all pictures of books I am reading, books I think are pretty, bookstores I like, and/or my dog wearing silly sweaters. I read the first book when it first came out, which meant I waited for each and every single solitary book to follow, which meant I went to a lot of midnight book releases. I even worked at a local bookstore for one of them, and wore a homemade glitter-y Harry Potter tank top to work that night while decorating the store in all HP everything (including a snitch and a broom hanging from the ceiling). Notice that we made the drink cooler into Hogwarts Cafe. No corner of the store escaped undecorated. When my then-boyfriend-now-husband and I talk like our dog (that's a normal dog-owner thing, right? ), we speak in Dobby's voice, because Indy and Dobby have the same crazy expressive ears. 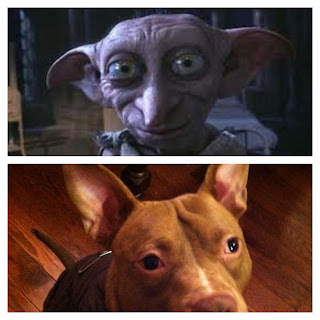 Indy will be going as Dobby for Halloween next year. So, full nerd-dom confessed, I am setting out to re-read the whole series which I conveniently own in a boxed set with what promise to be some very fun fellow readalongers. Read on! "(I read the first book when I was ten so my eleventh birthday was simultaneously the most stressful and disappointing birthday ever, because, spoiler alert, I never did get an owl)"
Ahaha That is amazing. And sad for eleven-year-old you. But mostly amazing. I'm pretty damned excited by how much Harry Potter brings people around our age (...I assume you're around my age) together. We might be into way different books normally, BUT THEN THERE IS HARRY POTTER, who binds us all. Your fellow readalongers are the funnest. This will be awesome. I was well and truly convinced I'd be getting an owl, too! You are so right about it bringing people together (mid-twenties, yes?) - we grew up with these books! They ARE our childhood! I am so looking forward to this whole readalong. What an excellent way to start the year. I am impressed both that you read it in Latin and that that is a thing. Also your 11th birthday sounds so sad. But in truth I'm picturing you sitting on your front stoop with a stick/wand and homemade robes waiting for the owl. This will be SO GREAT! My dad actually gave me the Hobbit in Latin this year for Christmas, too, although I've forgotten enough Latin that I can barely read the first sentence, let alone the first page. (I've also memorized the opening line to the Hobbit, though, so maybe I'm cheating on that, too...). My 11th birthday wasn't TOO sad, but there may have been a wand involved. I'll never tell. It's preeeeeetty cool that you worked at a bookstore for one of the release parties! I am impressed. I didn't go to any of them though because *whispers* I didn't buy any of the books for full price, but my sister went to a few and then she'd come home and read it, and then I'd read it straight after her. Which worked out nicely really! It was totally cool to work at a bookstore for the release! (Plus I didn't have to pay full price for my book, either, because I got an employee discount. I did have to wait until 3AM to get off work to start reading, though...). Yep, I'm totally doing this too :) Also, that four year age difference seems really big when you're comparing the first release date. Sigh. It is a pretty amazing thing, I'll grant you that! "Also, when the sixth book came out, my then-boyfriend-now-husband and I were too broke to buy two copies, so we bought one and read it out loud to each other since we didn't want to wait for the other to finish it before starting. #truelove"
That is the cutest. This readalong is going to be so funnnnn! And holy crap, yay you for reading the first book in Latin. Even if you can't do it now, that is impressive! I know I can't wait! I wish I could still read it in Latin. Languages are so hard to learn and so easy to forget. Unfair. OMG YOUR DOG. AND EXPRESSIVE EEEEEEARS. That's all I got for now. More later. Seriously, he alternates between looking like Yoda and looking like Dobby on any given day, and his ears are easily the size of the rest of his head, and they twitch a lot. It is pretty much the only reason we adopted him (luckily he also turned out to be a pretty nice dog, too). 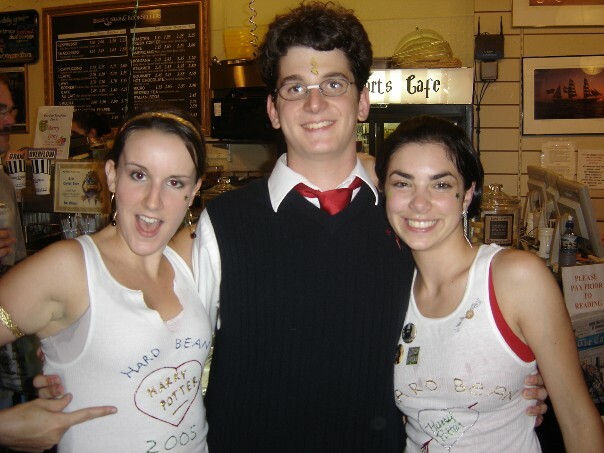 1.I also worked at a bookstore during one of the midnight releases (Deathly Hallows). 2. Your dog looks just like MY dog, only mine is Grey. And I also have pictures of him on instagram in sweaters. Imma need some pictures of this dog-that-looks-like-Indy-but-is-grey. Preferably pictures involved sweaters. Your 11th birthday is completely heartbreaking! Plus side - your dog is the cutest. So cute. This'll be my first reread of the entire series in order, too! Like you, I've reread all the books, but just on their own, and haphazardly. Needless to say, this will be glorious. It will definitely be glorious. Glorious beyond glorious. I can't figure out why I've only re-read haphazardly (good word choice), but clearly it is time to fix that. Ugh, that thing with your then-boyfriend now-husband made me question why *I* never got a chance to do that with my boyfriend. I suppose we did listen to the whole series on Audiobook when we travelled across Japan BUT IT ISN'T AS SWEET AND GUSHY DAMN IT! But the reading to each other is so romantic and old-school, while we were basically just passing the time (he doesn't particularly like HP - It's a thing). I'll admit the Japan part was most definitely awesome and tiny bit adventurous though. 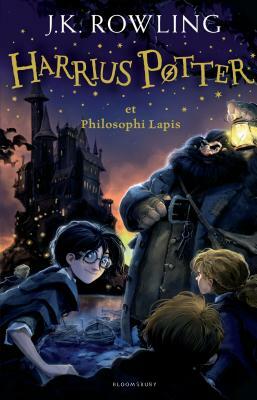 Harry Potter in Latin? Awesome. I'm really stoked about this readalong. I'm pretty sure that I'm going to love HP this time around. Harry Potter Readalong... and so it begins!